I had the distinct pleasure and fortune last month to appear on “Viewpoints,” a syndicated radio show in Canada (broadcasting to London as well! ), talking about the Rogue One trailer release. Apparently I acquitted myself well, because host Todd van der Heyden invited me back to talk about the upcoming Force Friday festivities happening at retailers this coming Friday, September 30. 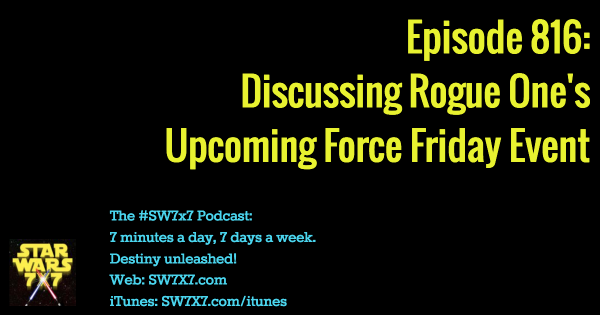 In today’s episode, I’ve included an excerpt of that interview, which covers the background of Force Friday and how well it performed for Lucasfilm last year, as well as why it’s of interest to people who aren’t necessarily interested in collecting or gifting the toys. There’s more to the interview, which if you can hear on the Viewpoints radio program in London and across Canada, or you’re like me and based elsewhere, you can catch it online. Where, might you ask? How about right here? I’ve embedded the SoundCloud audio for you, but it’s here too in case the embedding doesn’t work for you. I’m on right after the 1 hour and 50 minute mark. BTW, here’s the source of the nearly $1 billion in sales estimate for last year’s Force Friday event. Today’s question: How many TIE Fighters did Finn shoot while he and Poe were trying to escape from the Finalizer? Previous Post: Episode 815: Star Wars 2020 Movie and Beyond!